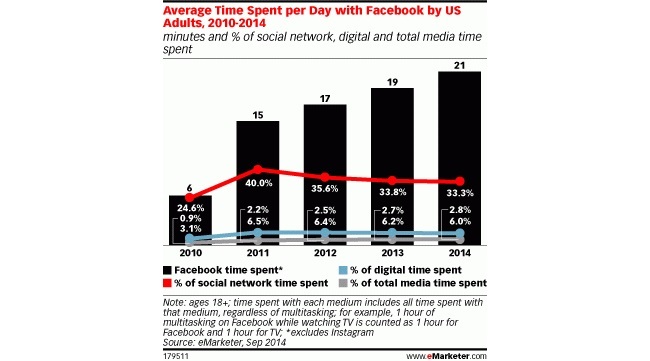 Adults in the U.S. will spend an average of 21 minutes per day on Facebook in 2014, or 6 percent of their digital time, but 10 percent of U.S. digital ad spending goes to the social network, whereas in other digital media categories, U.S. adults’ digital time usage percentages are higher than digital ad-spending percentages, according to new data from market researcher eMarketer. According to eMarketer, that 21 minutes per day accounts for one-third of the time U.S. adults spend on social networks daily, as well as 2.8 percent of time spent with all media. eMarketer projected that average time spent per day with all major media among U.S. adults will rise by 21 minutes in 2014 compared with 2013, to 12 hours and 28 minutes, with time spent on digital devices accounting for five hours and 46 minutes. Video will take 15.9 percent of users’ time on digital devices but account for 11.7 percent of spending. Online radio will take 11.2 percent of users’ time but account for 4 percent of spending. Other social networks, not including Facebook, will take 11.9 percent of users’ time but account for just 3.9 percent of digital ad revenue. Comparing time spent and ad spending on Facebook site-to-site (or application-to-app, as the case often is), our forecast also broke out time spent with Pandora for the first time. In 2014, U.S. adults will spend 7.1 percent of their daily digital media time listening to Pandora, according to our figures. 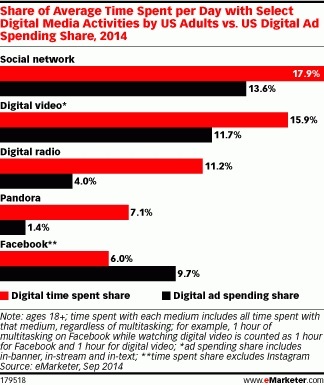 That’s not a misprint: For the average U.S. adult, daily time spent with Pandora exceeds daily time spent on Facebook. However, Pandora will account for 1.4 percent of U.S. digital ad spending this year, a fraction of Facebook’s share. Several factors contribute to Facebook’s unusual position in the digital environment. For example, Pandora is often on in the background, and users can tune out the ads or simply not hear them. Similarly, while digital video is an engrossing activity, viewers can easily ignore or skip ads, and targeting the right viewers is still challenging for marketers in the nascent medium. On the other hand, Facebook users’ attention is likely to be closely focused on content, where interspersed ads are not so easily ignored (even if users prefer they would be). In addition, Facebook has worked very hard to convince advertisers that its audience, customer data and targeting capabilities are the best advertisers can buy, which has contributed to it trending ahead of the market. Readers: Did any of eMarketer’s findings surprise you?